These Baltic ports didn't make my selective Top 5 Baltic port list, but have special qualities that attract visitors. Den Gamle By. It's an open-air museum with reconstructed old Danish buildings with traditional furnishings (right photo). The seaport's waterfront in the Fiskebrygga (fish market area). Offers a good photo opportunity. Four-masted windjammer museum tour. Ship launched in 1903 and sailed as far as Australia. Museum hopping. Stars include Viking Ship, Kon-Tiki, Munch, Polar Ship, and National Gallery. Old Town. For a memorable bird's eye view of this tight-packed area, take the elevator in St Peter's Basilica. The Bornholm heritage museum and the Erichsen house & garden museum are worthy venues in this laid-back island town. For many cruisers, it's the daytrip shore-excursion gateway to Berlin (several hours away by road or rail). 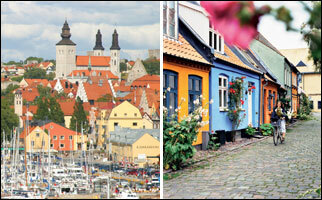 The Old Town is camera-friendly and is surrounded by a tower-perched Medieval defensive wall. Elsinore, Goteborg, Helsingborg, Kalmar, Karlshamn, Karlskrona, Kemi, Korsoer, Kotka, Malmo, Saaremaa, Turku, and Umea.